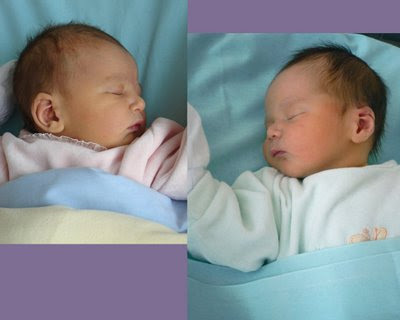 Across 2 Cultures - Cross-Culture Parenting and Lifestyle Blog: Twins? Well, well, I knew my kids look alike as babies but this just proves it all. When I showed friends who came by this image, which is used as the background of our desktop, most would not have guessed it was two different babies. Had it not been for the pink pyjamas that Laetitia had on, I would not be able to tell the difference too. yeah... cant really tell except when you look at the color of the hair, the ear and the lips. they'll grow to be so alike.. err but then... they ARE from the same parents so that's all but natural right?